Bex stays over at the brand-new Chessington Azteca Hotel! 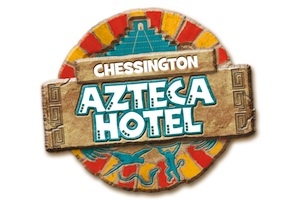 So I was mega lucky and got to be one of the very first people to try out the brand-new Chessington Azteca Hotel! The hotel is now open for business and looks like the ruins of an ancient Aztec temple! There’s 69 rooms and you can even see some of the animals from your window! The first thing I saw was an actual iguana, and this giraffe peeking out of the wall (don’t worry, I checked, he’s not real). There were tribal dancers and drummers waiting for me, and in my room there was a treasure map to find some hidden goodies! I managed to figure out the clues and got some sweets and cuddly monkey toys! The hotel even has a special chair- when you sit on it, it makes the noise of your Animal Spirit. Mine was a lion, which I was very happy about! Then I got to wander around the park – don’t worry, I tried out all of the rides (including Vampire, Dragon’s Fury, and Bubbleworks) and had an awesome time! Well, I can’t wait to go back! Explore more from Bex now!